Driving Porsche North America Racing’s no. 911 Porsche 911 RSR, Nick Tandy and Patrick Pilet gave Porsche overall victory in the 2015 Petit Le Mans at Road Atlanta, overcoming the prototype classes during a race severely affected by torrential rain. Weissach’s first outright win at Petit Le Mans also saw them secure all three Tudor United SportsCar Championship GTLM class titles, with Pilet taking the drivers’ crown at the season finale after the race was called off early. An already remarkable triumph was made all the more spectacular by the fact that the Anglo-French aces had to start at the back of the 37-strong field following a ride height infringement during qualifying. Victory gave Patrick Pilet (centre) the drivers’ title. Richard Lietz (left) didn’t drive as the race was shortened. Heavy rain had affected running on all three days of the event at Road Atlanta and, in a soaking wet qualifying session the excellent traction of the 911 RSR allowed Earl Bamber in the no. 912 PNAR car to take GTLM pole, just a fraction of a second ahead of Tandy in the no. 911 entry. However, shortly after setting two laps good enough for pole, Bamber found himself in the barriers in the car he shared with Jörg Bergmeister and Frédéric Makowiecki. The crash would force the team to revert to a spare chassis, forcing them to start at the back of the grid alongside Tandy and Pilet. Come the race on Saturday, conditions had not improved with rivers still running across the track in places. However, both practice had qualifying had shown the 911s had a pace advantage in such conditions, not just over their GTLM rivals but many of the top class prototypes. Too much time in the pits stymied the no. 912 Porsche 911 RSRs challenge for victory. Aided by their excellent Michelin wet tyres and some spectacular driving by Bamber and Tandy in their opening stints. By lap 16, the factory RSRs, headed by the Briton, were leading the GTLM field as Tandy, at times, lapped faster than the prototypes. After the first hour, problems for some of the prototypes saw Tandy leading the race outright in the Porsche 911 RSR for the first time. However, the no. 912 wasn’t enjoying such luck, with various stops in the pits (including a stop-go penalty) dropping them four laps down. While the no. 912 RSR would eventually come home eighth in GTLM, Tandy and Pilet’s pace saw them become genuine contenders for outright glory. Even when a race stoppage after five hours and 21 minutes left them down the field, the duo had the pace to carve back through the pack. In the soaking wet conditions experienced in Georgia this weekend, the no. 911 Porsche 911 RSR proved more than a match for the prototype classes. Before the race went back to green, Pilet pitted to hand over to Tandy, leaving the no. 911 RSR in fourth before jumping to third when the race went green. A ninth safety car period neutralised proceedings again soon before Tandy went on a charge at the restart. By lap 190, this year’s 24 Hours of Le Mans winners, swept around the top Daytona Prototype to take the overall lead and, when the race was finally stopped after nearly eight of the scheduled ten hours, the first outright victory for a GT car at Petit Le Mans. Not only did this success, defend Porsche’s manufacturers’ crown, it also gave the no. 911 crew (who had scored four victories this year) the teams’ title as well as securing Pilet the drivers’ championship, a fitting end to a near-perfect 2015 season stateside for Porsche. For all the latest Porsche race and rally news, check out our dedicated motorsport section now. 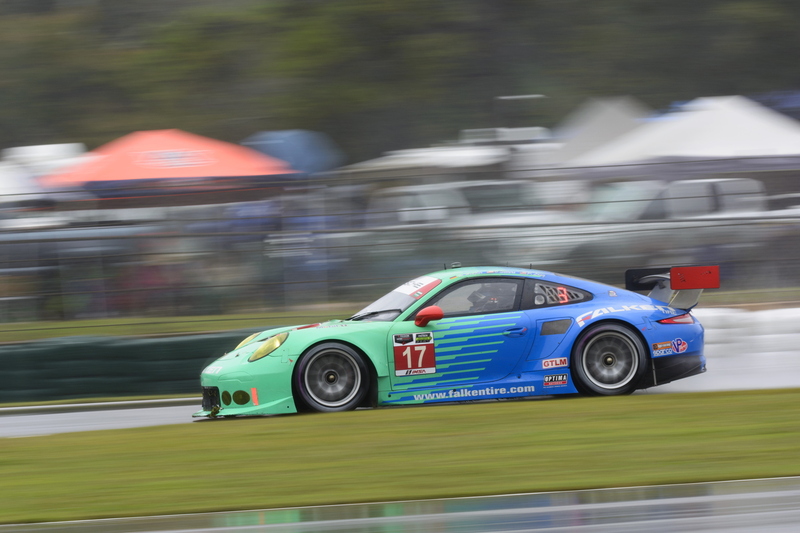 The Walker Racing-run Team Falken bowed out of competition with 11th place overall having been an early contender for the win.